Hillary Clinton confirmed on Sunday what much of the political world has taken as a foregone conclusion for months, if not years: she's running for president in 2016. 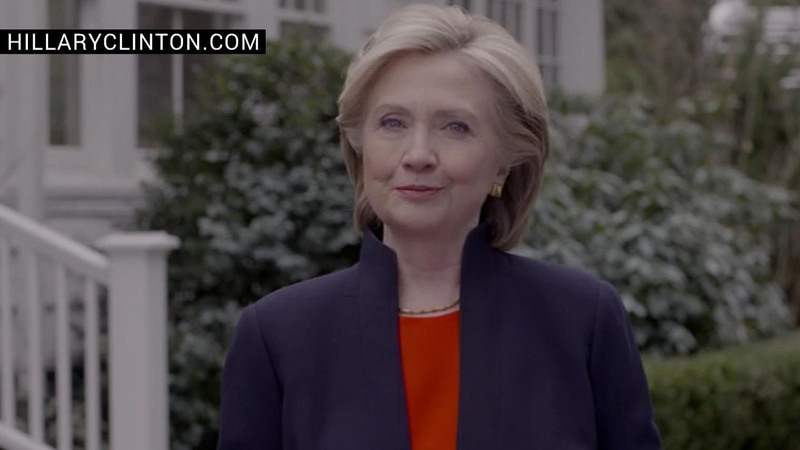 The former secretary of state, senator, and first lady formally announced her candidacy in a video Sunday afternoon. The video features a group of Americans talking about preparing for different life events. "I'm getting ready to do something too. I'm running for president," Clinton says. "Americans have fought their way back from tough economic times. But the deck is still stacked in favor of those at the top. Everyday Americans need a champion, and I want to be that champion. So you can do more than just get by, you can get ahead and stay ahead. Because when families are strong, America is strong. So I'm hitting the road to earn your vote. Because it's your time, and I hope you'll join us on this journey." Clinton also tweeted the announcement, sharing her campaign website with followers and unveiling the campaign's new logo. The video was preempted minutes earlier by an e-mail message to donors and campaign alumni from campaign advisor John Podesta. He wrote, "I wanted to make sure you heard it first from me - it's official: Hillary's running for president." Analysis: Will Hillary Clinton become the next president? The quiet launch of Clinton's campaign stood in stark contrast to the speculation about her plans that had reached a fever pitch over the last several months. She won't hold her first major campaign rally until May, instead, she's embarking on a softer rollout that will emphasize smaller, intimate events in the early caucus state of Iowa designed to downplay her celebrity and allow her to interact one-on-one with voters. In a memo sent to members of Clinton's team Saturday, campaign manager Robby Mook outlined the values that are supposed to guide the campaign: "To give every family, every small business, and every American a path to lasting prosperity by electing Hillary Clinton the next President of the United States. This campaign is not about Hillary Clinton and not about us--it's about the everyday Americans who are trying to build a better life for themselves and their families." Hillary Clinton: "I'm running for president"
Among the guiding principles he listed: "We are humble" "We are a diverse, talented family" and "We are disciplined: driven every day by strategy, not tactics or one offs." Clinton will take her campaign on the road next week with a visit to an early voting state, likely Iowa. Though her team hasn't confirmed her destination, the choice of Iowa would be symbolically significant to Clinton - it was her loss to then-Illinois Sen. Barack Obama in that state's 2008 caucuses that dashed her aura of inevitability in that year's Democratic primary and began the road to her defeat. Making the Hawkeye State her first official campaign visit would signal that she intends to take nothing for granted this time. Clinton, 67, has been a fixture of American public life for decades. She was Arkansas' first lady when her husband Bill was governor, and she became first lady of the United States when Bill Clinton assumed the presidency in 1993. She ran for a Senate seat in New York in 2000, and spent nearly eight years as a member of the Senate before launching her first bid for the presidency in 2008. Though she was defeated in the primary that year by Mr. Obama, she joined his cabinet as secretary of state when the new administration took the reins in 2009. The Republican National Committee immediately sought to throw cold water on the announcement. In a statement, chairman Reince Priebus said, "Americans need a president they can trust and voters do not trust Hillary Clinton. Over decades as a Washington insider, Clinton has left a trail of secrecy, scandal, and failed policies that can't be erased from voters' minds." Other declared and expected candidates for the Republican nomination were also swift to condemn her record, and a few even sought to fundraise off her announcement. On many domestic policy issues, Clinton has generally hewed closely to the current administration's policies. She's defended Obamacare from GOP attacks, embraced the administration's proposals to overhaul the tax code and reform the immigration system, and lauded Mr. Obama's proposals to expand pre-kindergarten education and reduce the cost of college. On foreign policy, she's seen as relatively hawkish, for a Democrat. She voted to authorize the 2003 invasion of Iraq, though she now says that was a mistake. As secretary of state, she pushed (successfully) for U.S. military action to oust Libyan dictator Moammar Ghadafi, and she pushed (unsuccessfully) for the administration to arm Syrian rebels fighting the regime of Bashar Assad. She was also credited with marshaling international support for sanctions on Iran, laying the groundwork for the current negotiations over that country's nuclear energy program. Women's equality has been a particular focus of Clinton's time in public life, from her famous declaration at a 1994 conference in Beijing that "women's rights are human rights," to her creation of the Office of Global Women's Issues at the State Department. Though she did not particularly emphasize her gender or the historic nature of her candidacy in the 2008 race, she's signaled that she plans a more concerted effort to elevate women's issues - and woo female voters - in the 2016 campaign. If she wins, she would make history as the first female U.S. president. Can Hillary Clinton justify her frontrunner status? Is Hillary Clinton vulnerable on women's rights? Since she left the administration in 2013, Clinton has written a memoir, "Hard Choices," embarked on a book tour, and hit the paid speakers' circuit. She became a grandmother last year when her daughter Chelsea gave birth to a daughter, Charlotte Clinton Mezvinsky. In an updated epilogue to "Hard Choices," Clinton wrote about how Charlotte has refocused her political priorities, offering a hint about how being a grandmother could shape her 2016 campaign themes. "You shouldn't have to be the granddaughter of a President or a Secretary of State to receive excellent health care, education, enrichment, and all the support and advantages that will one day lead to a good job and a successful life," she wrote. "I'm more convinced than ever that our future in the 21st century depends on our ability to ensure that a child born in the hills of Appalachia or the Mississippi Delta or the Rio Grande Valley grows up with the same shot at success that Charlotte will." It hasn't been entirely smooth sailing for Clinton since she stepped down from the State Department. Her book tour was somewhat marred by a few awkward answers about her personal finances, and she's faced intense scrutiny in recent weeks about her use of a private email server as secretary of state. She's said it was a decision made for the sake of convenience, and that she's already turned over any work-related emails to the state department. Critics have accused her of breaking federal archiving rules for the sake of maintaining absolute control over her privacy. Republicans have also questioned her family foundation's receipt of money from foreign governments, raising the possibility that the donations could pose a conflict of interest. Clinton has emphasized that the money has been spent on valuable philanthropic work, and she's said the foundation will not accept any foreign money during her campaign or (if she wins) her presidency. Clinton Foundation officials confirmed to CBS News Sunday that Clinton is stepping down from her post there. A foundation official told CBS News that the boards of the Clinton Foundation and the Clinton Health Access Initiative will also consider changes in their donor policies this week. The official says changes include more frequent disclosure of donors. The official did not say whether that includes revisiting restrictions on foreign donations. Officials have previously said that would be something they'd consider when she announced her candidacy. Clinton is the first Democrat to formally announce a 2016 candidacy, and she's considered an overwhelming favorite for the party's nod - early polls show her ahead of her potential primary competitors by as much as 50 points nationwide. A CBS News poll last month found 81 percent of Democrats would consider voting for her in the primary, while only 10 percent would not. Despite Clinton's commanding position, there's still room for a challenger: 66 percent of Democrats said they'd like to see her face a strong competitor in the primary. Other Democrats weighing a bid include Vice President Biden, former Maryland Gov. Martin O'Malley, and former Virginia Sen. Jim Webb. Vermont Independent Sen. Bernie Sanders has also said he might jump into the fray. Her announcement was not enough to quiet the groups championing a presidential bid by Sen. Elizabeth Warren, D-Massachusetts. They promised to redouble their efforts to convince Warren to enter the race in order to give more of a voice to issues like income inequality and Wall Street accountability. Warren has repeatedly said she is not running for president. Though it's still early in the cycle, most polls show Clinton leading her prospective Republican challengers in the general election. A McClatchy-Marist survey last month, for example, found Clinton ahead of former Florida Gov. Jeb Bush and Florida Sen. Marco Rubio by seven points nationally, ahead of Wisconsin Gov. Scott Walker by four points, and ahead of Kentucky Sen. Rand Paul by 11 points. Clinton's 2016 campaign architecture is starting to come into focus, and it's a subject of fairly intense interest, given the infighting and opaque command structure that plagued her last bid. Democratic strategist Robby Mook will manage the campaign, Podesta, a veteran Democratic operative, will assume a senior leadership role, possibly campaign chairman, and longtime Clinton aide Huma Abedin is expected to serve in a senior advisory role. Joel Benenson, who was Mr. Obama's pollster in 2008, has signed on to Clinton's 2016 bid as well. The campaign has leased space in a Brooklyn office building to serve as its headquarters. Apart from the formal campaign structure, Clinton's bid stands to benefit from a constellation of outside liberal groups that have been formed in recent years. A grassroots group encouraging her to jump into the race, Ready for Hillary, has already raised millions of dollars and is expected to spend millions more amplifying Clinton's campaign message. She's also inherited the support of Priorities USA, a super PAC that was formed to boost President Obama in 2012. And a group called Correct the Record will serve as an independent rapid-response outfit, fact-checking and rebutting conservative attacks against Clinton. It's likely she'll need all the help she can get. Few Democrats have absorbed as much criticism from Republicans as Hillary Clinton has absorbed over the years, and the attacks will only become more frequent and more heated as the 2016 campaign progresses. Already, the GOP's potential candidates are regularly assailing Clinton in their public appearances, and the Republican National Committee [RNC] is training its fire on Clinton as if she'd already won the Democratic nomination. In an online ad released Friday, the RNC attempted to sow doubts about Clinton's tenure as secretary of state and her use of a private email server. "From the East Wing to the State Department, Hillary Clinton has left a trail of secrecy, scandal and failed liberal policies that no image consultant can erase," said RNC Chairman Reince Priebus in a press release. "Voters want to elect someone they can trust and Hillary's record proves that she cannot be trusted. We must 'Stop Hillary.'"